After Adam and Eve sinned, they sewed together fig leaves into aprons to hide their nakedness because they did not want God to see them in that condition. (Genesis 3:7–10). However, an apron only covers part of the body. So God made them coats to clothe them (Genesis 3:21). When instructing Israel in His requirements, included were specifics in dress, e.g. 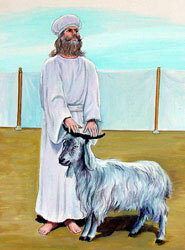 a "ribband of blue" around the hem of their garments to remind them to keep all of the commandments of God (Numbers 15:38–40); and details as to the priests' garments when they appeared before Him in service including the wearing of breeches under their outer garments to "cover their nakedness" (Exodus 28). "In like manner also, that women adorn themselves in modest apparel, with shamefacedness and sobriety: not with broided hair, or gold, or pearls, or costly array; But (which becometh women professing godliness) with good works" (1 Timothy 2:9, 10). "Whose adorning let it not be that outward adorning of plaiting the hair, and of wearing of gold, or of putting on of apparel; But let it be the hidden man of the heart. In that which is not corruptible. even the orttament of a meek and quiet spirit, which is in the sight of God of great price" (1 Peter 3:3, 4). God does not give instruction merely to deny His people. No, rather it is for their protection because He loves them so much. And how should we dress? Simply. Choosing clothing of good material, modest in length and design, not to attract attention. Men and women should be neat, attractive, and comfortable. Consider that you are constantly in God's presence, to cultivate habits of character, deportment, and apparel fit for Heaven through the power of Jesus "that the shame of thy nakedness do not appear" (Revelation 3:18).